This armed conflict was fought between the Pequot tribe and an alliance of the Massachusetts Bay, Plymouth, and Saybrook colonies with their American Indian allies — the Narragansett and Mohegan tribes. At this time, the Pequot tribe was centered along the Thames River in present-day southeast Connecticut and as colonists expanded westward, friction began to develop. The war was the culmination of numerous conflicts between the colonists and the Indians including property disputes, livestock damaging Indian crops, competition over hunting grounds, the selling of alcohol to Indians, and dishonest traders. Tensions came to a head in July 1636 when a dishonest trader named John Oldham, was killed by the Pequot. As a result, numerous settlers demanded that the Pequot be punished for the killing and Massachusetts Governor John Endicott began to raise a militia. The soldiers allied themselves with the Mohegan and Narragansett tribes, who were rivals with the Pequot. In late August, the militia launched an expedition against Block Island, part of Rhode Island, killing 14 Indians before they burned the village and crops. 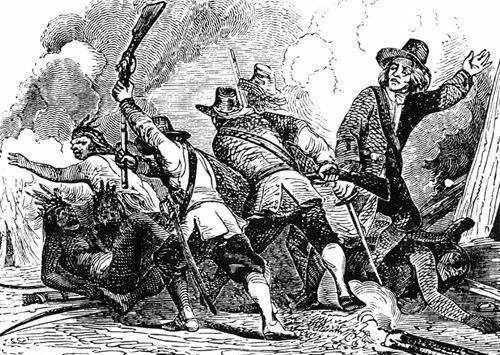 A number of skirmishes would follow over the next year, until the colonists attacked a Pequot village on the Mystic River (near present-day New London, Connecticut) in May 1637. Encircling the Indians under the cover of night, the colonists set their dwellings ablaze, then shot them as they fled from their homes. From 400 to 700 Indian men, women and children were killed. Hundreds more were captured and sold into slavery to the West Indies. The Pequot Chief Sassacus was captured by the Mohawk and executed.